Discord: get involved, but stay secure! So the Nimiq team have recently announced that the tool to convert your NET (temporary ERC20 token) to NIM (mainnet currency) is live, well done team! Lots of people already have a stash of NET that they may have already sent to the conversion tool. This post is aimed at helping people who don’t already hold NET tokens. Maybe you’ve just found out about Nimiq, which is fantastic, so I thought it would be sensible to share how to get hold of some NET before the mainnet launches. Please keep in mind, NET was always designed to be a temporary token, within 6 months of mainnet launch you’ll either need to sell it, or convert it to NIM. Now, I’ll assume you already know how to buy one of the main cryptocurrencies, if you’re looking at Nimiq you probably do, and if not, there are loads of easy exchanges (Coinbase etc) that allow that. NET tokens are currently listed on a few smaller exchanges, but for this post I’m going to focus on Liqui.io because it normally has the highest (although still relatively small) volume of trading. Setting up an account on Liqui is very simple, just add some basic details and that’s it! Because the exchange only involves crypto-to-crypto trades there are less procedures than exchanges involving FIAT currency. Once you’ve got your account open you want to be looking for the NET markets. 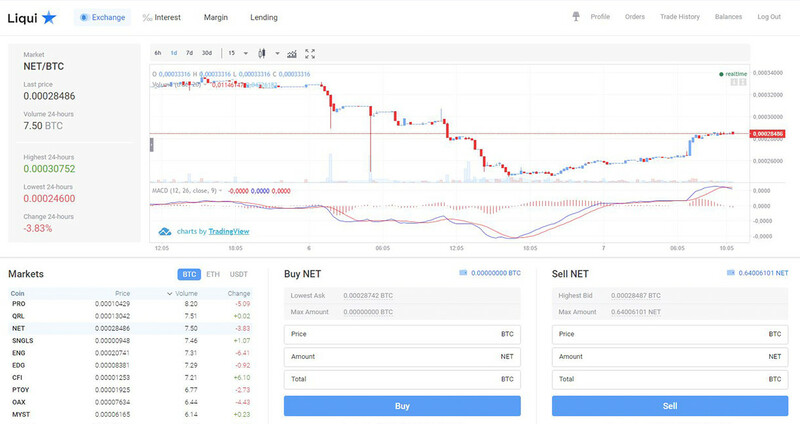 You can trade NET for ETH, BTC or USDT. Find the relevant market in the table on the left side of the screen and select it. Liqui doesn’t allow you to ‘market buy’, you have to place a buy order. This order can however be below the current market price, so that it will be instantly filled. Choose the amount of NET you wish to purchase, and the price you wish to pay, and your order will either be filled or posted on the market, hopefully someone will then come along and sell to you! Once you’ve bought your NET, you’ll want go to your ‘Balances’ page to confirm how many you hold. You will then see a withdrawal button against the NET balance. It’s always recommended to withdraw your tokens to a wallet where you hold the private key, in case the exchange encounters difficulties of some kind. NET is an ERC20 token, so it can be held in any Ethereum wallet. If you don’t already have some form of Ethereum wallet one of the easiest ways to set one up is by creating a paper wallet on MyEtherWallet. When you go to withdraw your NET from Liqui you need to send these to the public address of your Ethereum wallet. The tokens will then be listed separately when you view the wallet on a site like Etherscan. You can then hold these tokens, trade them, or use the conversion tool to trade them for NIM, which you will receive once the mainnet launches. 1 NET will convert to 100 NIM. Hopefully that all seems very simple! Buying NET tokens is a great way to get involved in the project as it’ll encourage you to learn more about Nimiq, the team and their work. Please keep in mind that once the mainnet launches, you’ll need to convert your NET to NIM, or sell them, within 6 months. 2018 Nimiq Community. All sushi reserved. Nimiq is the blockchain designed for simplicity. Nano clients synchronize in seconds. Nimiq is browser-based and installation-free.